In the past, a large percentage of farmers used pesticides that affected the taste and underlying health of crops, but today’s farmers are going organic with safe and effective options in termite pest control. Termites and other pests pose a great deal of harm to crops, but using traditional pesticides can be even more dangerous. With this guide, you will understand not only the dangers of termites in farming but also different options in organic pest control. Most people associate termite damage with homes. However, termites are actually one of the most damaging insects to gardens and farms. Termite damage in agriculture can occur in a few different ways. First, termite infestations can eat through the wood and plant cellulose, halting the growth of crops. Second, termites can infiltrate the farm’s infrastructure by infesting and eating through poles and fences. Lastly, termites can eat through containers that ship out agricultural products. Insects not only consume crops, but they can also spread disease through the crops. Due to this risk, farming requires pest control. Unfortunately, the use of traditional pesticides can wreak havoc on crops and the surrounding environment. The chemicals used in most traditional pesticides are toxic to the crops, but they can also affect the groundwater. Once the pesticides run off into the groundwater, local water sources will become toxic, increasing the risk of illness and disease. While pesticides are usually applied to the ground, they will eventually turn into a vapor gas. This gas will travel through the air, affecting a large area of landscape and numerous parts of the wildlife. Proper Irrigation – Ensuring the farm is properly irrigated will keep the soil and crops healthy, decreasing the decay that termites find appealing. Organic Materials – Termites feed off dead materials that have low organic matter. Adding organic matter, such as compost and manure, to the soil will make the crops less appealing to termites and other pests. Barriers – Creating physical barriers using metal mesh, sheeting or gravel can also reduce the risk of a termite infiltration. Also, many organic farmers use bar magnets near termite mounds. These magnets halt the growth of termite mounds, which can prevent termites from moving to the crops. 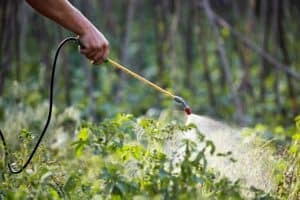 Botanical Pesticides – Botanical pesticides, created from plant parts and extracts, may also be effective against killing existing pests while preventing new infestations. Leafy extracts from neem, garlic, papaya and sandalwood plants have been proven successful against pest prevention. The dangers of termites and pesticides in agriculture can be frightening, but help is available. To learn more about organic termite pest control in the Frisco, TX, area, contact Safe Pro Pest at (972) 435-0700.